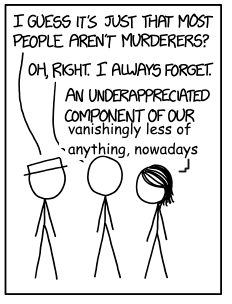 ITT: We make xkcd slightly worse. 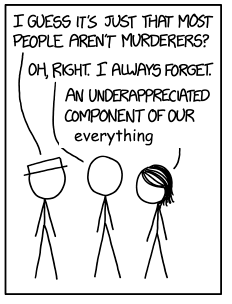 Re: ITT: We make xkcd slightly worse. Sableagle wrote: It's all about the dose, isn't it? 1 centametre3 of rock entering the Earth's atmosphere at 15 km/s: goodbye, city. Most of the color names on the left are real, but the three two-word ones are references to the blog post, and a couple others are just ones I threw in as filler because I've run out of time to fiddle with it. Alt: I didn't even ask for your help. I'm teaching every 8-year-old relative to say this, and every 22-year-old to do the same thing with Toy Story. Also, Pokémon hit the US almost two decades ago and kids born after Aladdin came out will turn 26 next year. Next Monday marks the day when "Scary" is halfway between 9/11 and the present. Using the graphics from 1907 but otherwise nothing to do with it. Alt: Why do people keep wanting to hang out with me?! I think I got this up before the actual discussion thread for this comic. ... Win? This one's been bugging me for a while, so I made it slightly worse. I mean, the widget's kinda ugly, but you've gotta admit it does the job. I'll take a shot at this one. Alt: Specific numbers just make things more confusing. Assuming the axiom of choice. If they don't have access to the axiom of choice, an infinite number of them die. Planck Temperature, good for oneupping the Celsius fans who complain about the arbitrariness of Fahrenheit. Your scale doesn't handle negative tempuratures. Which are a thing even in Kelvin. Alt:Time travel - not recommended for assholes. Before anyone complains, TV Tropes will sort out the mechanics here. Alt: "Oh... well that's nice, then." A disturbing number of my conversations are ending this way lately. Wait, I liked the world in previous panel better! Lemme go back to that one! Can you post that as an attachment? Cynical, but well slightly worse done, Sableagle. Huh. I could have sworn I'd already seen one here based on 1931 before. Image based on xkcd comic 1931 "Virtual Assistant" with graphic elements from xkcd comic 442 "xkcd Loves the Discovery Channel", both by Randall Munroe and published under CC-BY-NC 2.5. Text and image modified by myself, modified image also published under CC-BY-NC 2.5. Last edited by svenman on Mon Apr 16, 2018 9:56 pm UTC, edited 1 time in total. supposed to be important, but GET OUT OF MY WAY AND LET ME WORK!! "Great, now there'll never be a cure for cancer." "Nice going, Steve." Here's a cropped version of 445 with some dialogue added. See also 222 and 1961. 1992 - combining the current version of the regular-sized image with the one that went up on the website originally. Title text: Yes, I know that's what I get for submitting the results of my work at the end of pulling an all-nighter. It's what I tell myself every. Damn. Time. Something. Like. This. Happens. Image based on xkcd comic 1992 "Safety Sat" by Randall Munroe (both originally posted and corrected version), published under CC-BY-NC 2.5. Text and image modified by myself, modified image also published under CC-BY-NC 2.5. Alt text: Now, after we get it back to the original course, how gradually do we need to move it back so the state line will follow it properly? Fixed 2010 to be more internet-screenshot-accurate. I couldn't decide whether to leave it as "I have licked your" or change it to "you have licked our" and then I stopped halfway and thought: well, that's even worse than either.